A day exists that is dedicated to the commemoration of the International Day of Women Defenders (November 29th), which recognizes the women who, individually or collectively, work for compliance with the rights recognized in the Universal Declaration of Human Rights and related norms. This day was proclaimed during the First International Consultation of Women Defenders held in Colombo (Sri Lanka) in 2005, and has been commemorated every year since November 29,, 2006. Furthermore, the first resolution of the General Assembly of the United Nations was passed on December 18, 2013, which dealt with women human rights defenders and persons defending the human rights of women. 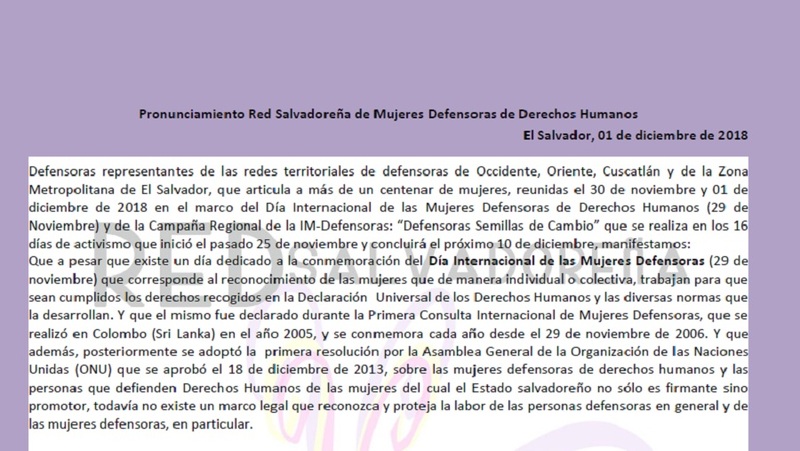 The Salvadoran government signed and promoted the resolution, but there is still no legal framework in the country that recognizes and protects the work of rights defenders in general and women defenders in particular. In El Salvador as in the rest of Mesoamérica, women defenders do our work in the midst of numerous attacks. In the 2017-2018 period alone, at least 30 attacks against women defenders have been registered in El Salvador. The most common are intimidation, harassment, disparagement, smear campaigns, search and seizure, and physical attacks that have gone so far as feminicides. This was the case with defender Dina Yaseni Puente, assassinated on August 9, 2018, when she was struggling against the privatization of water and in favor of the protection of forests. The risk situation of women defenders of land and territory is aggravated by ties between private businesses, government officials and / or public servants, and members of political parties that favor the exploitation and expropriation of common assets, as in the case of the approval of Megaprojects and Special Economic Zones. Defenders of Sexual and Reproductive Rights work in a context of fundamentalist and extremist speeches and actions that legitimize violence against women and expose them to stigmatization and prejudices that condemn victims and / or survivors, as in the case of Imelda Cortez and the women defenders who accompany her. Women defenders work in precarious conditions, and in the majority of cases we have no remuneration or fixed employment. Many women defenders, for example, only have income that comes from working as artisans, and foreign businesses often sell their products without setting a value that takes artisans’ time and effort into consideration. Women defenders suffer different kinds of impacts on our physical, mental and emotional health due to the kind of work we do. In presidential elections, not a single candidate has recognized the work of women defenders or expressed a commitment to respect the human rights of women. That the government work to eradicate violence against women and protect our labor in compliance with international treaties. That the government investigate and see that justice is done for the feminicides and attacks against women defenders. That the government urgently pass the Law for the Comprehensive Recognition and Protection of Human Rights Defenders in El Salvador and that it reform or repeal laws that infringe upon the protection of persons. That the agents of justice and other public officials comply with their duty to protect and guarantee the lives and integrity of women defenders. That the general public recognize the labor of women human rights defenders, cease to be indifferent to the risk situation that we face, and assure that our integrity is protected. Let’s defend women defenders! Let´s defend the “Seeds of change”!